A Giggles Welfare Organisation is a registered non profit, non government organization working extensively in the field of disability rehabilitation, HIV/AIDS awareness for prevention, care giving facilities to people suffering from such disease. 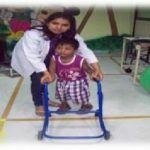 The team of Giggles Rehabilitation center is having experience of more than 15years in field of treatment and rehabilitation of disabled children. A Giggles Welfare Organisation was established in 2007 to offer services for children with impairments. Giggles means a smile, a smile makes one’s day; it brings us back to life, more so if it’s a child’s giggle. Our center has taken up the endeavor to bring back the lovely giggle back on the faces of our special children and their parents through our services at Giggles Rehabilitation Center. As a private agency we provide special education as well as therapies to these mentally and physically disabled children, our staff members have a variety of backgrounds (special education, counseling, early childhood development and psychology etc.). They are all certified (or in process of) with the Rehabilitation council of India. Some additional staff acts as consults or mentors as needed in various areas like occupational therapy, physiotherapy, neurodevelopment therapy, sensory integration therapy, speech therapy etc. These consultants are available at our rehab center or on call to our rehabilitation center. Nutrition is fundamental for a child's normal growth and development and it seems likely that nutrition even as early as the fetal stage may be a determinant of adult health. 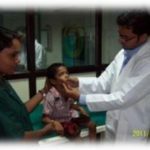 We offer free medical consultation to disabled children & provide assistance for critical care treatments like corrective rehabilitative surgeries, orthopedic surgeries, Botox injections, eye surgeries. Cochlear implants in various leading hospitals. The Department of Occupational therapy promotes health, wellness, productivity and quality of life by teaching skills & functions essential for a productive, satisfying & self sufficient life. Our therapists are expertise in improving vestibular integration, strengthen muscles, develop joints & body alignment. The department of physiotherapy gives opportunity to patients to regain control over their lives. Many patients suffering from pain & functional impairment are able to find hope & recovery. The focus of physiotherapy program is to improve the individual’s quality of life by alleviating pain & increasing tolerance for activity. Through psychological counseling and psychotherapy our therapist helps individual cope with educational, adaptive, social, behavioral and emotional problems in a caring and secure environment. We offer all types of speech and language( habilitation to rehabilitation) programs to children and pre-adolescence. Our goal is to facilitate success to each individual’s ability to communicate.